A recipe?! A what?! I cook?? Who knew! Ok, confession: I made this soup weeks ago. I’m just so far behind on posting (I still have the Philly trip to post, I still have the Michael Solomonov guest chef event at Local Roots to post, I still have other recipes to post, ack! ), but I’ll catch up. And at least this soup was tasty–and definitely perfect as an early-autumn recipe. When I picked up two eggplants (the regular purple globe kind) from the Thistle Dew Farm folk at market, I had no idea what I wanted to do with them. I was thinking baba ghanoush, since I’ve actually never made it (that and kale chips–what’s wrong with me? I’m so far behind on the food fads! ), but in the end I settled on soup since it would work better as a packable lunch if I got called in to substitute teach (which I did). This recipe from Food & Wine was the original one I worked from. I loved the simplicity and clean flavors the recipe promised, and I wasn’t disappointed with the end product. The roasted carrot and onion added sweetness to the soup while the eggplant and lentils lended an earthy tone. Plus you can’t beat a recipe that mostly calls for roasting and then pureeing! So perfect for the busy schedule I’m on these days. I think the recipe works well as a base for almost any roasted veggies, so I’d say give it a whirl, see what works with whatever you have on hand! Preheat the oven to 400°. Place the eggplant, carrots, and onion quarters on a rimmed baking sheet, skin side down. Drizzle with 1 tablespoon of the olive oil and season with salt and pepper. Bake until very tender, about 30 minutes. Meanwhile, in a saucepot, heat 1 tsp olive oil over medium heat. Add the minced garlic, dried thyme, paprika, and 1/2 tsp salt, pinch of pepper. Swirl in pot for 1 minute, until fragrant. Add the lentils and cover with 2 inches of water. Bring to a boil, then lower to a simmer. Cook for 20 minutes, until the lentils are tender. Drain lentils in colander. Scrape the eggplant flesh into a blender; discard the skin. Add the carrots and onion to blender. Add 1 cup of the stock and puree until smooth; transfer to a clean saucepan. Add the lentils and the remaining 1 cup of stock to the blender and puree until smooth. Add the lentil puree to the eggplant puree in the saucepan. Stir the milk and lemon juice into the soup and bring to a simmer. Season with salt and pepper; keep the soup hot over low heat, stirring occasionally, until heated through. Sounds quite tasty! I do wonder, though, whether a bit of silken tofu would be better than adding non-dairy milk, simply because the acid of the lemon might curdle the milk. Although, maybe that makes it tastier? Well, I do know that you can make tofu from soymilk by heating it and adding a coagulant or lemon juice (there’s an original Iron Chef battle in which they made fresh tofu using lemon juice), and I’m sure that if you add soymilk to a raspberry Italian soda you’ll get curdled yuck pretty quickly – and that was in the US. It could be that it just doesn’t affect the flavor all that much, which is good to know! I am not a big fan of eggplant, but I don’t mind it if it’s pureed (like baba ghanoush). Your soup definitely sounds like something I’d like! I’ve been getting a little behind on my posting too lately. Sometimes, by the time I get around to posting something I forget what I even wanted to say about it. Perfect timing – I bought an eggplant at the farmer’s market and don’t know what to do with it. And you know how I feel about lentil soup (or if you don’t, I love it). So basically I’m totally making this this week. I have never had eggplant in soup, but this sounds really interesting. 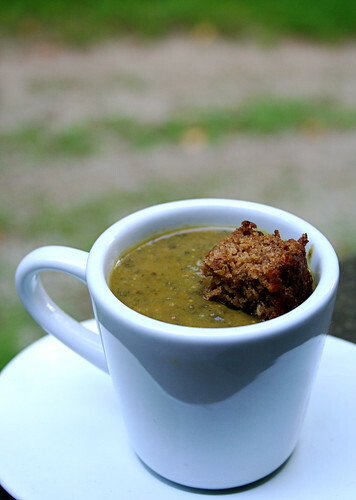 I love pureed soups, and with a little nut milk they get so rich. Great recipe! Thank you so much I wish you could be in LA to party with us, too. That soup looks deeeelicious. The weather is finally starting to cool off here, and that means it’s almost soup season! Roasted and pureeing? I’m sold! This looks delicious and perfect for the cold front that just rolled in. Oh yea! I’m collecting recipes for after Halloweegan (I’ll bee too tired to create my own) and this one has been duly bookmarked! you’re one busy bee, Jes – and you’re too awesome to take time to post your roasted eggplant ‘n lentil soup, my friend! it sounds like the perfect fall soup, indeed – and i can’t wait to give it a whirl! you’re description had me drooling, and i’m all about soups these days. mmmmmmmmmmm! looking forward to your next bunch of posts. yay! Okay. I’m officially jealous. You went to that dinner at Local Roots?!? Ah!!! So exciting! I’m on the waiting list for the Voltaggio dinner and crossing my fingers someone will cancel. Thanks, love! Can’t wait for some more RVA goodness! This looks like a really good soup, Jes. I like the idea of roasting all the veggies, and I can’t say I’ve ever considered using roasted eggplant in a soup. But this looks delicious!